Wolfenstein is back and it's as good as ever. When I first saw the game and the artbook, I was intrigued by the concept of creating a game based on an alternate universe where the Axis powers won World War II. And the execution of that concept into an actual game, developing the whole world behind it, that was excellent. There's this whole unreal feeling that carries on into Wolfenstein II: The New Colossus. The artbook's still a large format hardcover, this time with 184 pages. This book is packed with amazingly detailed concept art. First half of the book features the environment, and the second half features the weapons, props, characters, and propaganda poster designs. There is a lot to see and to take in because of all the details. Locations include Eva's Hammer, Ausmerzer, Manhattan, New Orleans, Mesquite, Texas, Germericana, Area 52 and Venus. You get to see inside the rooms of BJ and Naya, Caroline, Wyatt, Fergus and many other interior concept art of rooms and corridors on board the submarine and flying carrier. The attention to detail is spot on here, and applies to other sections. The concept of a devastated Manhattan and New Orleans is also very cool. There's definitely an end-of-world feel with a dose a realism. Germericana is eerie. 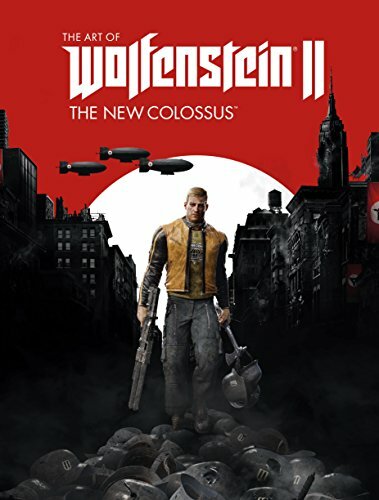 If you've not played the game yet, it's supposed to be an idyll small town but in this alternate universe, it's controlled by Nazis and there are all the Nazi designs all around. All the artworks for mechanical stuff in the book look fantastic. They are geared mostly towards heavy arms and artillery, which may be believable had World War II turned out the other way. The robots, mechs, weapons, armor of soldiers, uniforms, vehicles and all that look terrific. There are also plenty of character designs, mostly fully realised coloured illustrations. And the most iconic character in the war, Adolf Hitler, is included too. What you won't find in this book are sketches since most artworks are coloured. So yeah, this is a fantastic artbook for the fans, concept artists and those who collect artbooks. I was told that the earlier artbook or things that relates to Nazi Germany aren't sold in Germany. If you want to get this book elsewhere, you can order it from Book Depository.